Try something stylish but also easy-going for your dining room design. Let’s move from formal dining room style that usually applied by home owner. Be creative, free, and more spirit with Bohemian dining room design to upgrade your home. Add more patterns, colors, texture as like as you want. Bohemian always appears artistic, inviting, and attractive. You may see the prints and colors among this dining room. They show you about free spirit. There are some patterns form tablecloth, fabric on the wall, and the curtain that blend with bold color furniture. Let see mismatched dining chairs and a lovely dining table that actually add artistic value for this dining room. Various colors from green, orange, red, and others make this room look cheerful and inviting. More natural light keep this room appears vibe. This is actually outdoor dining set that let you see the view garden. The wicker dining set looks awesome with various plants. Just enjoy your time to eat meals or just sit down to get fresh air. 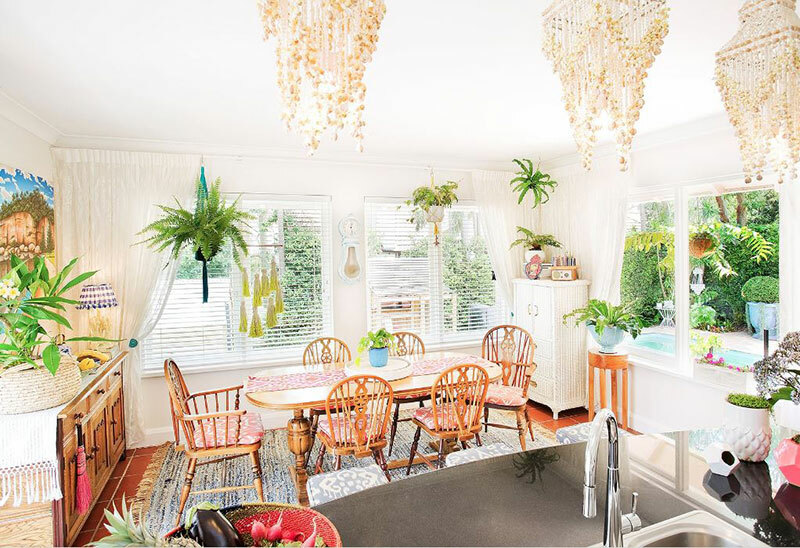 Dining room with high ceiling and sophisticated chandelier looks like summer. The chair with pattern, tablecloth, rug, and any other patterns appear in cohesive look. Moreover, some plants with different size come to upgrade this dining room look. Green walls and chairs look fresh and inviting. There are rug, striped chairs , and other component of this room that show Bohemian character in beautiful way. The owner of this house also collects some artistic accents from some journeys. A unique round table with eclectic chairs stands out perfectly. Then, a sofa with different pillows tells you about Bohemian touch. Moreover, a fabric hanged on wood branch acts as beautiful wall accent to complete this dining room design. Layering a dining room with beautiful patterns and textures makes this room has strong characters. Overall, this room appears in modern vibe but has traditional touch and industrial element as well. See form the chandeliers, furniture, and green plants. Wonderful wood furniture and flooring make this dining room rustic. However, the role of white walls gives modern touch. You can see a pattern rug that brings Bohemian style complete this dining room very well.